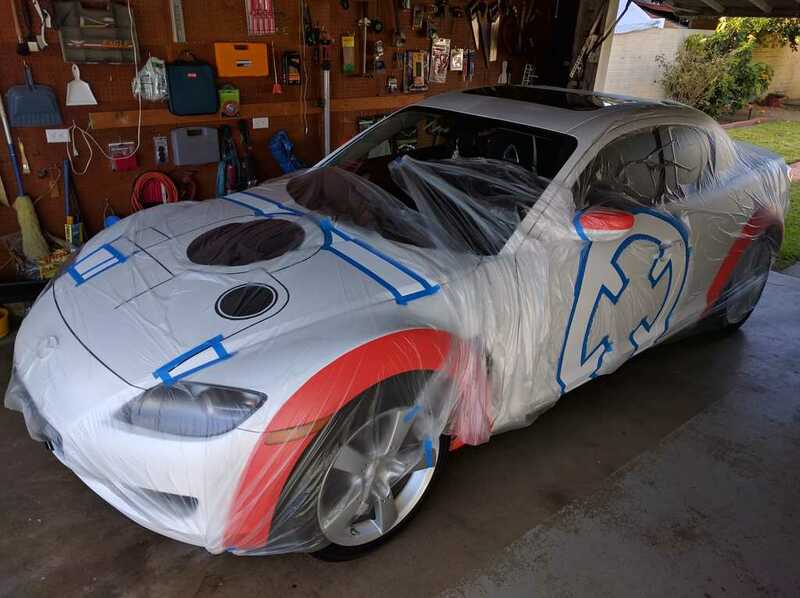 A fan tribute to the iconic Star Wars droid. See the latest activity on Facebook and Instagram. The following images are low quality to conserve bandwidth. For the high-quality versions, click on an image to open full-sized original in a new window. I have always been a fan of R2-D2. As the marketing for The Force Awakens started rolling, I casually skimmed the material looking for information about R2-D2's appearance in the new movie. I was pleasantly surprised when the teaser was released, showing a brief clip of BB-8. An equally enchanting but uniquely different take on the astromech droid. After watching the movie, I'm now a fan of both droids! I knew there was a robust online community of people who liked R2-D2 enough to try to build their own copy. Many of them rallied to form a sister community for building their own BB-8. I expect that I'd build my own droid eventually. In the meantime the BB-8 Builder's Club is a wonderful resource for reference material. The Mazda RX-8 is the most recent member of the Mazda rotary-engine family, featuring the novel Wankel rotary engine under the hood. It also featured an innovative interior packaging design accessible by half-doors, accomplishing its goal of putting four seats inside a sleek profile while maintaining the structural strength required for safety and performance. 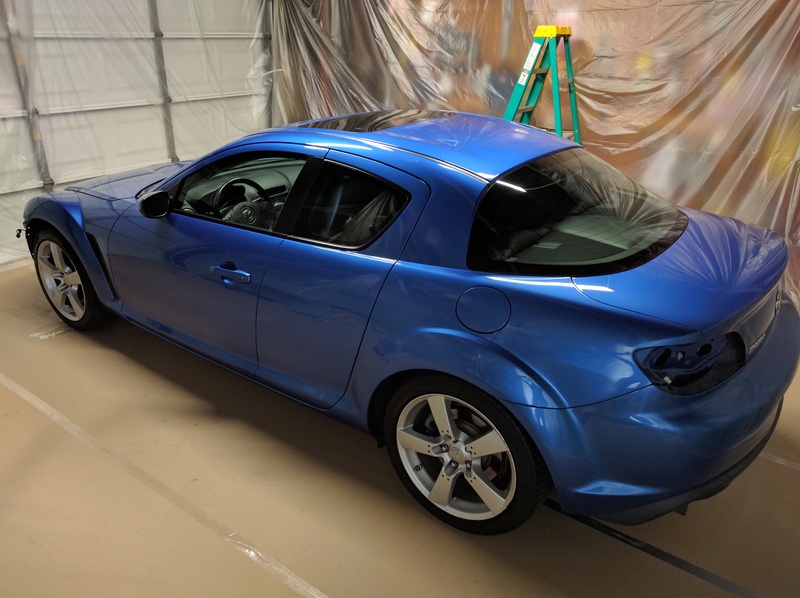 I like to support novel engineering like the RX-8 and I've been happy with my ownership experience. Plasti-Dip sprays like normal paint, it covers like normal paint, but it does not stick like normal paint. 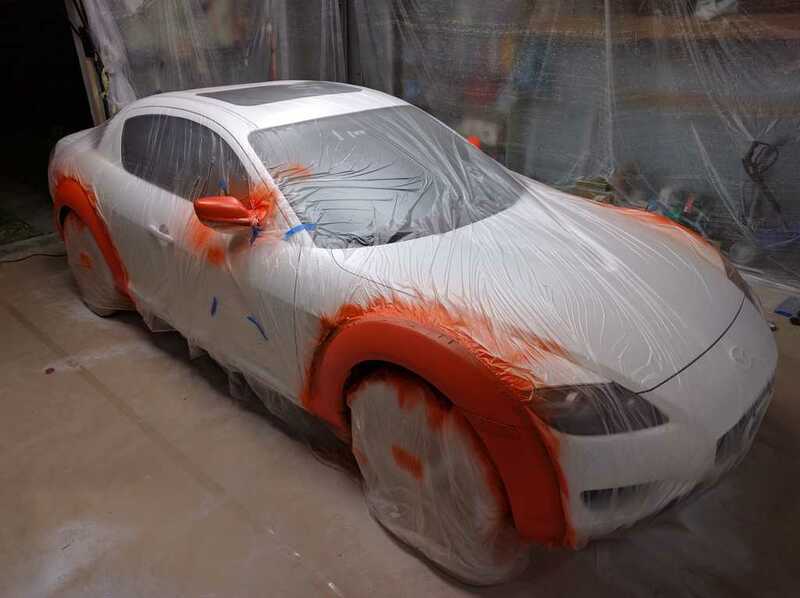 When applied properly, Plasti-Dip will peel off the original surface without damage. It can be used as a protective layer for the underlying paint, or it can be used for strictly cosmetic projects. I enjoyed building and painting 1:24 scale model cars in my preteen years. 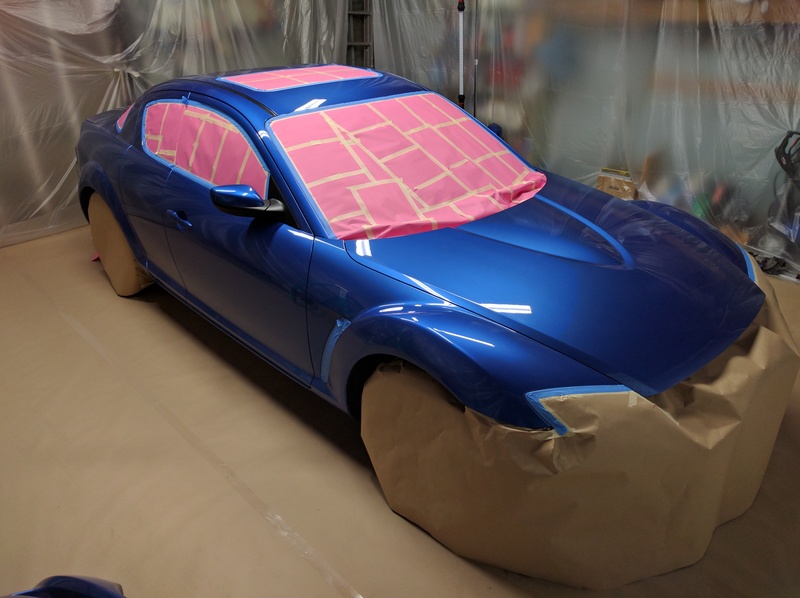 As soon as I knew about Plasti-Dip I wanted to revive my old hobby at 1:1 scale. 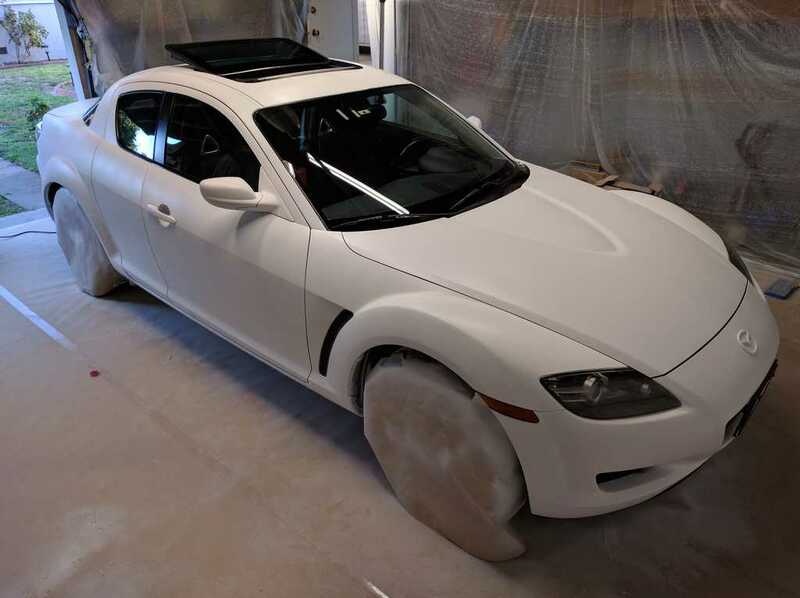 I started experimenting with Plasti-Dip on my RX-8, learning to work with the quirks of the material. 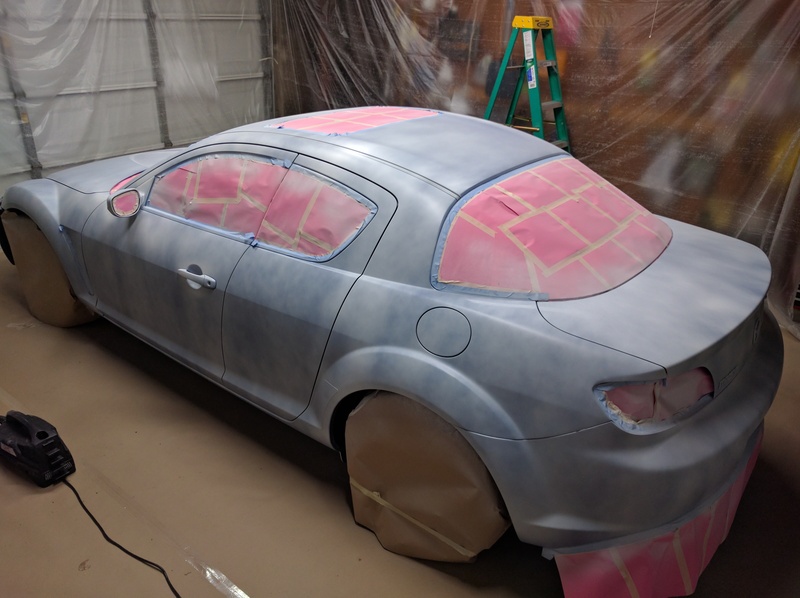 My first full-car project was a complete blackout treatment. The result has been compared to the Tumbler (Batmobile) and the F-117 Nighthawk (Stealth Fighter). 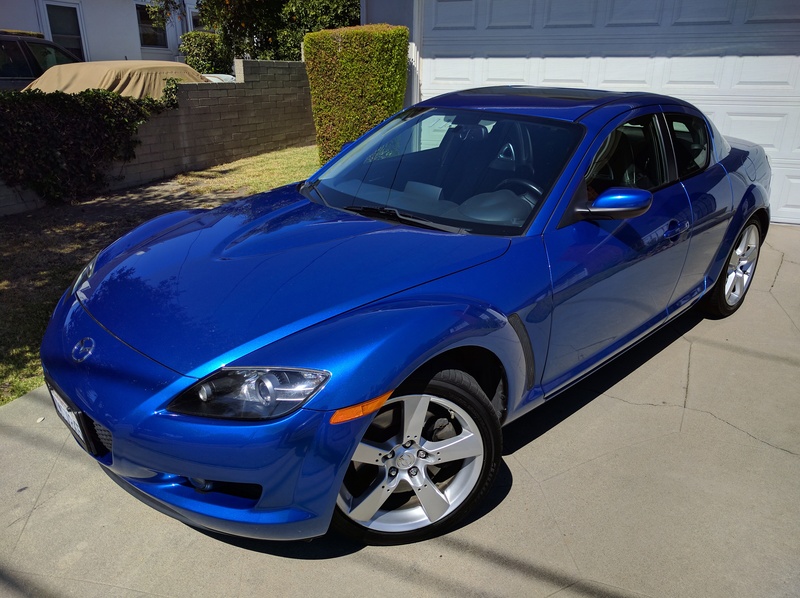 I enjoyed my flat-black RX-8 until I moved to southern California and started roasting under the summer sun. The black coat was peeled off and I started thinking about what I'd like to do for a light-colored project. 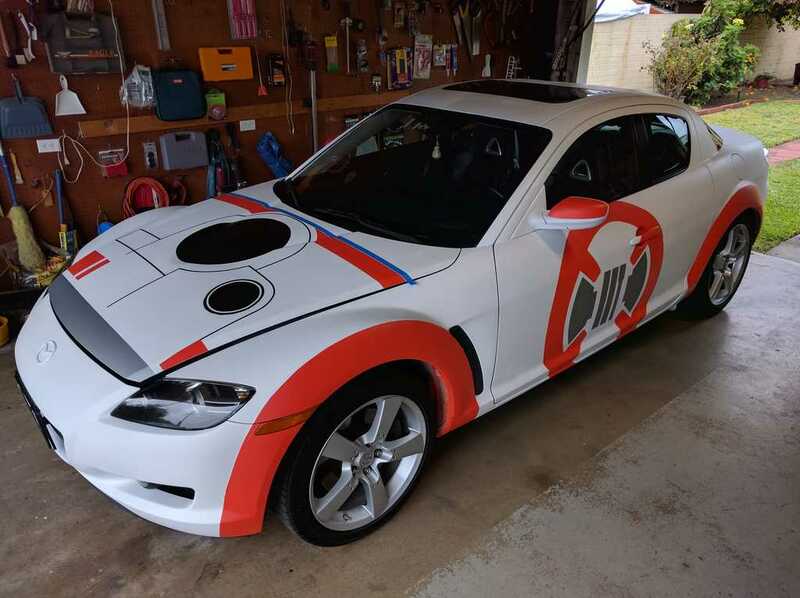 The answer was #rxbb8, this fan's tribute to the new Star Wars droid: A Plast-Dip BB-8 costume for my RX-8 to be completed by Halloween 2016. 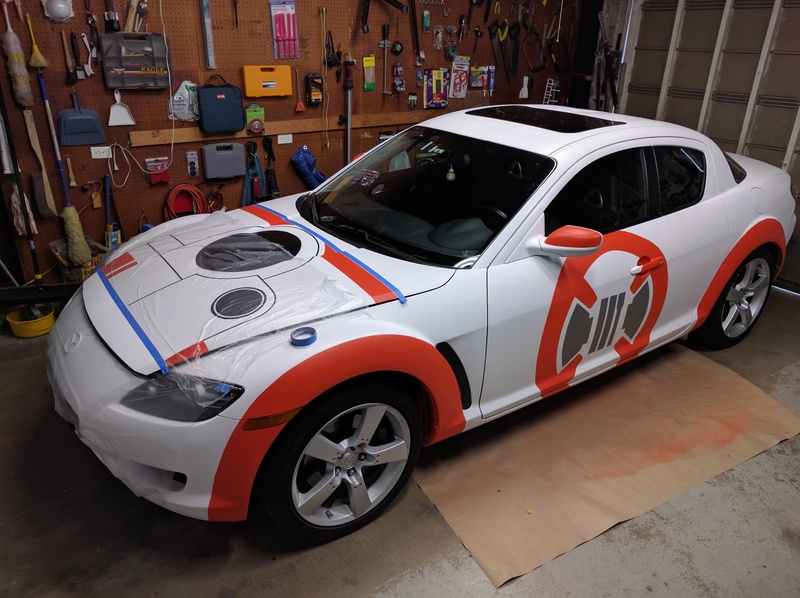 Here is the "Before" picture, my RX-8 about to receive a BB-8 Halloween costume. 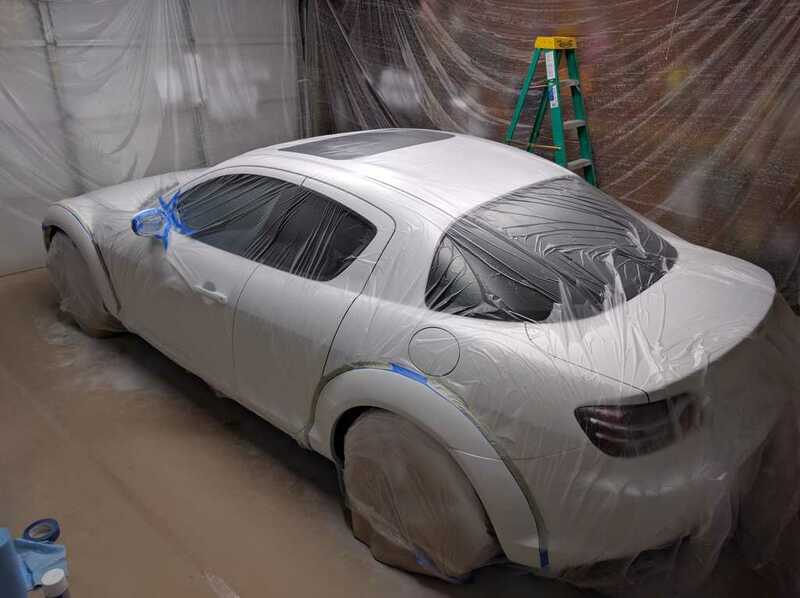 The factory original blue paint has been washed and dried for optimal Plasti-Dip adhesion. 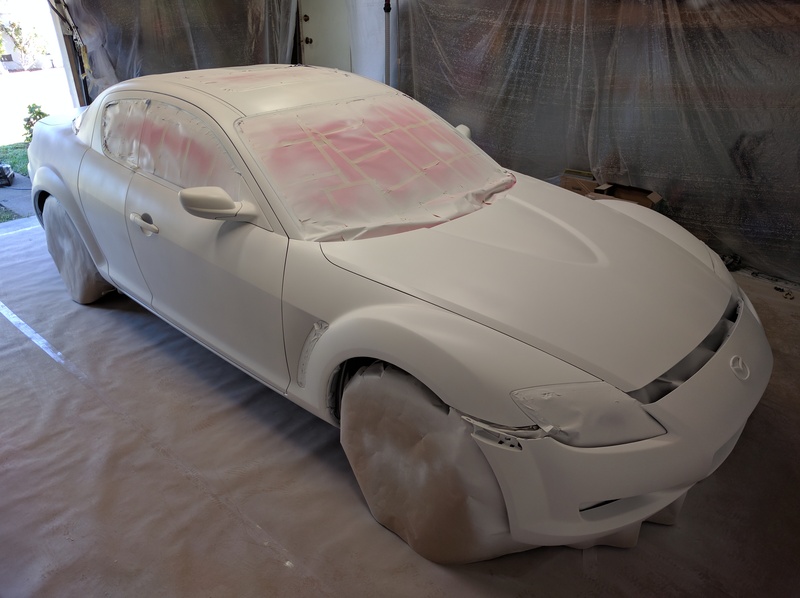 The base coat will be applied with a spray gun, so all areas not receiving Plasti-Dip must be masked off. For some minor pieces (like the rear tail lights) it's easier to remove them instead of masking them. The front bumper cover is a hassle to remove but it is still less hassle than masking the intricate curves. All glass surfaces were masked off with pink paper that I wasn't going to use for anything else. 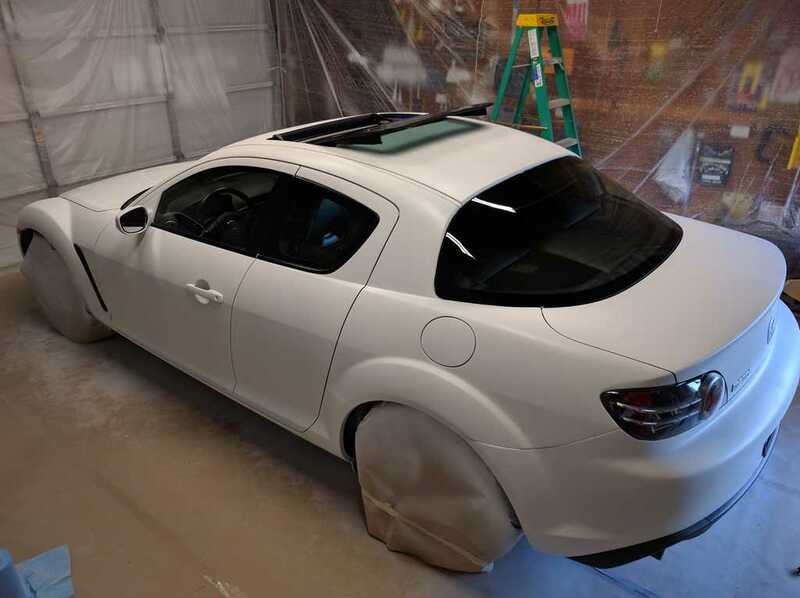 The wheels and headlights were masked off with thicker paper. 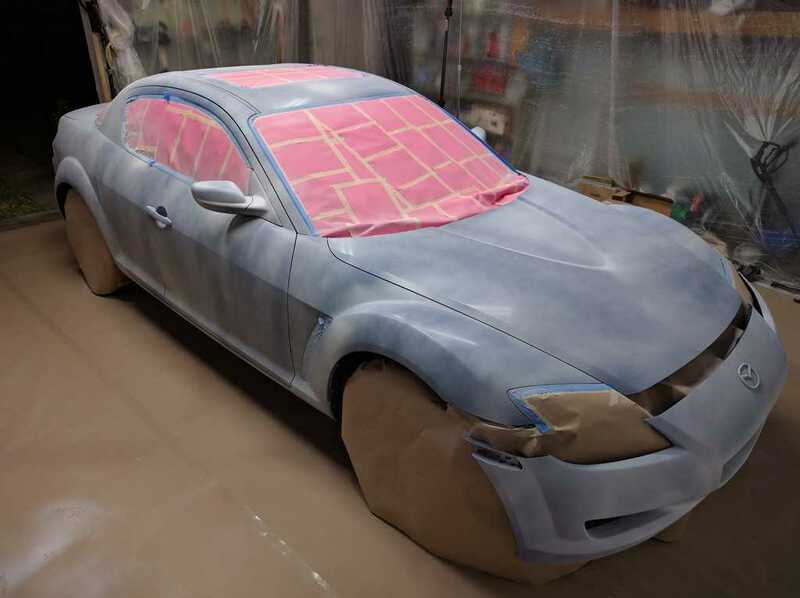 Masking with paper was an amateur's mistake: Plasti-Dip is a liquid, and liquid soaks through paper. 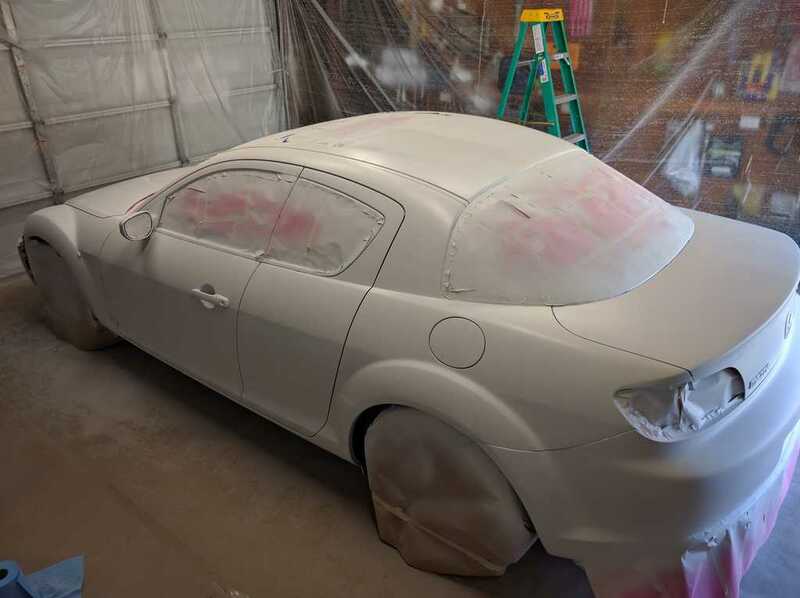 The first coat of Plasti-Dip needs to be a very light coat to adhere properly. It looks terrible but the base coat is important. Mistakes made at one layer usually compounds on all following layers, so the first layer deserves the most effort to get right. White is a challenging color to work with due to the poor coverage. 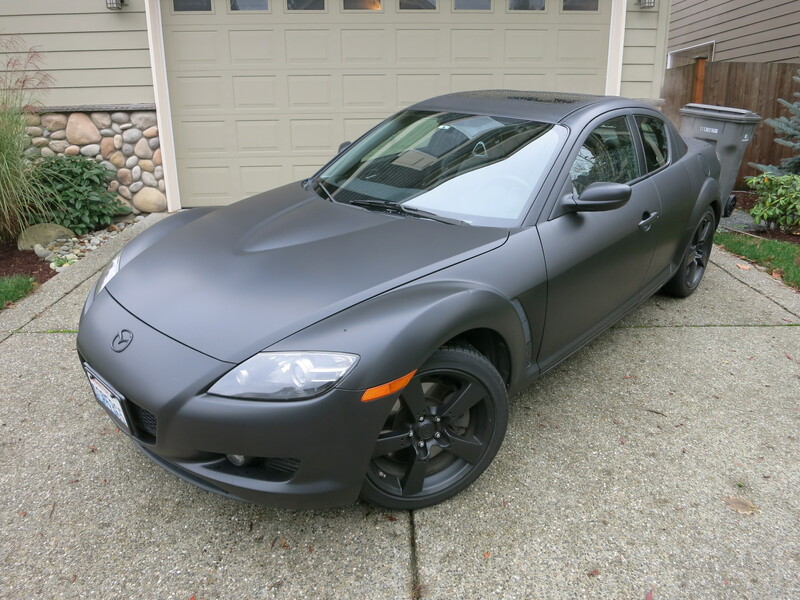 My previous Plasti-Dip project turned this car black, and I needed only three coats of black. In contrast, this project required six coats of white before I got to a satisfactory stage. Double the coats means double the practice but also double the mistakes. Once I got a solid base coat of white, I peeled off my paint mask. This is where I learned my valuable lesson about masking with paper. Fortunately, it is relatively easy to clean up the soaked-through Plasti-Dip off glass surfaces. It would have been a much messier job if the underlying layer was more Plasti-Dip. In fact I might have to peel everything off and start over. Once everything was cleaned up, I reinstalled the trim pieces. 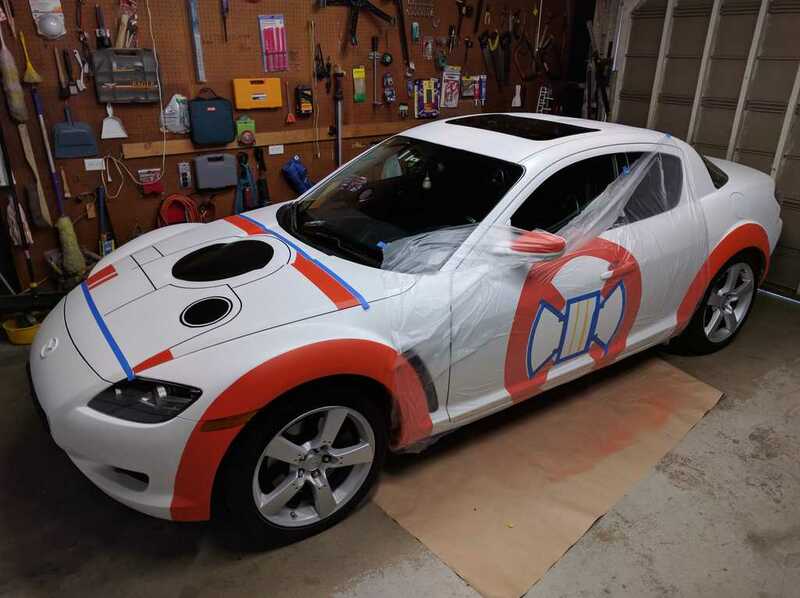 The white base layer is now complete, time to set up for the orange accents starting with the wheel arches. I'm also doing the side rearview mirrors at the same time. Since this is the first run with a spray can of high visibility color, I was paranoid about overspray and masked off the entire car. The mirrors were masked along existing seams between plastic parts, which is a very simple job. 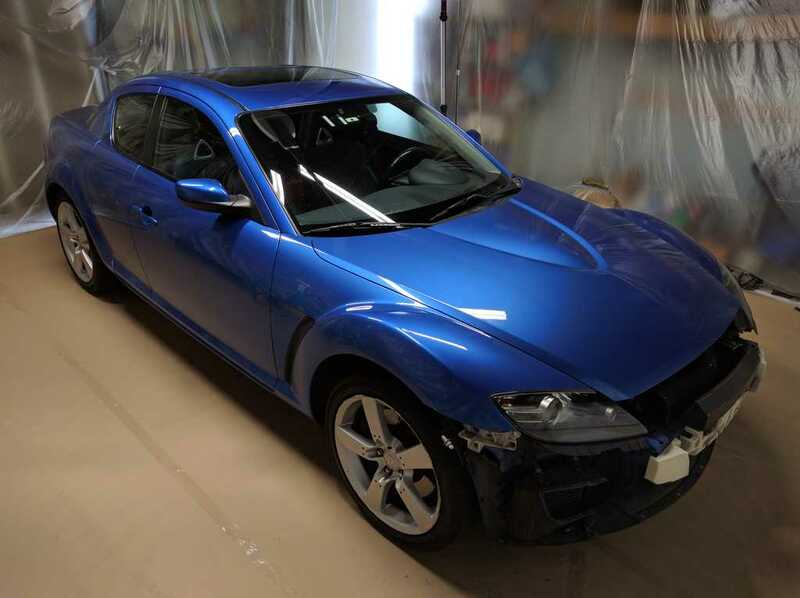 The wheel arches were masked following the arches that already existed on the RX-8 body. This was slightly more difficult because (1) there's a slight radius to the edge so it is not precise, and (2) I'm using masking tape designed for straight lines. This is where I begin to value high-quality flexible masking tape for use on curves. 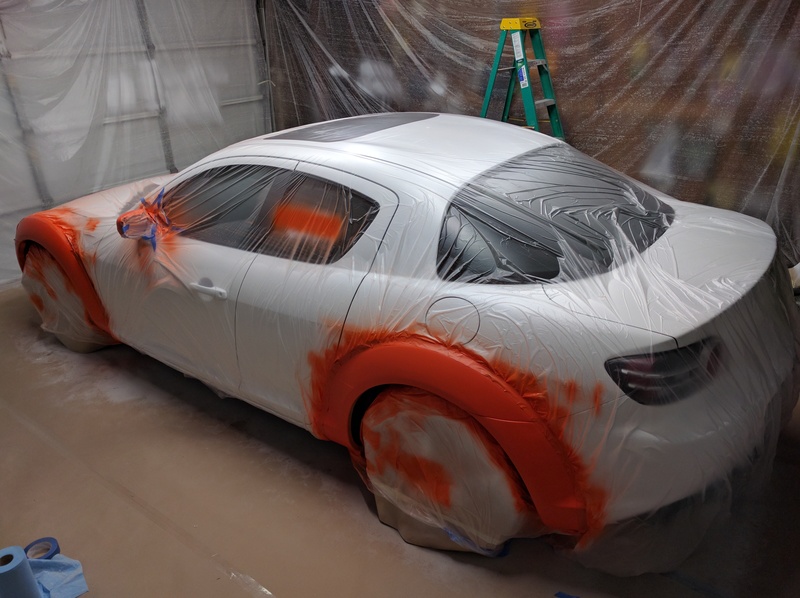 A solid orange was obtained after three coats of spray. 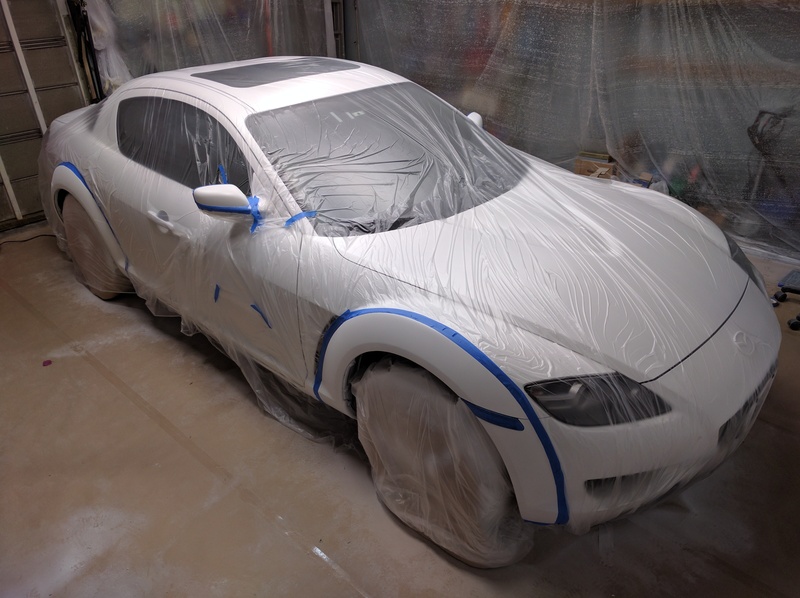 The overspray wasn't as bad as I had feared, so I'll be gradually reducing the plastic masking area to find the right balance between protection and time spent masking. 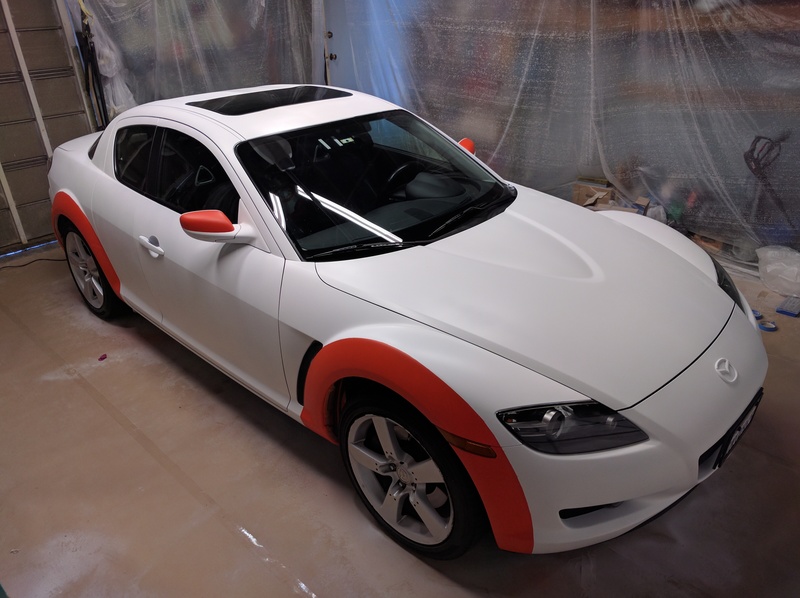 After the painter's plastic (much more effective than paper) and masking tape were removed, the car is starting to show a little personality to differentiate it from a plain white RX-8. This is where things start to get really fun. 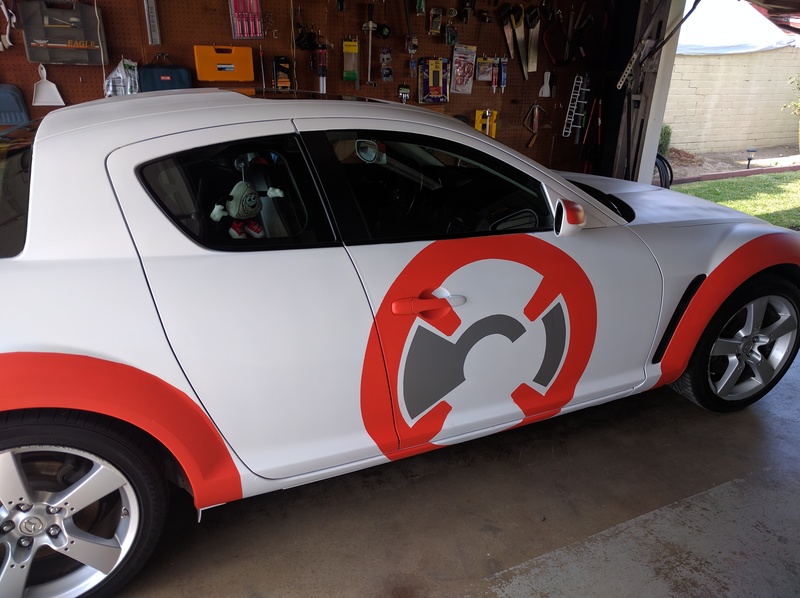 The next challenge is to mask out the graphics for the side of the car. Unlike previous stages, this time there is nothing on the car itself to guide me. 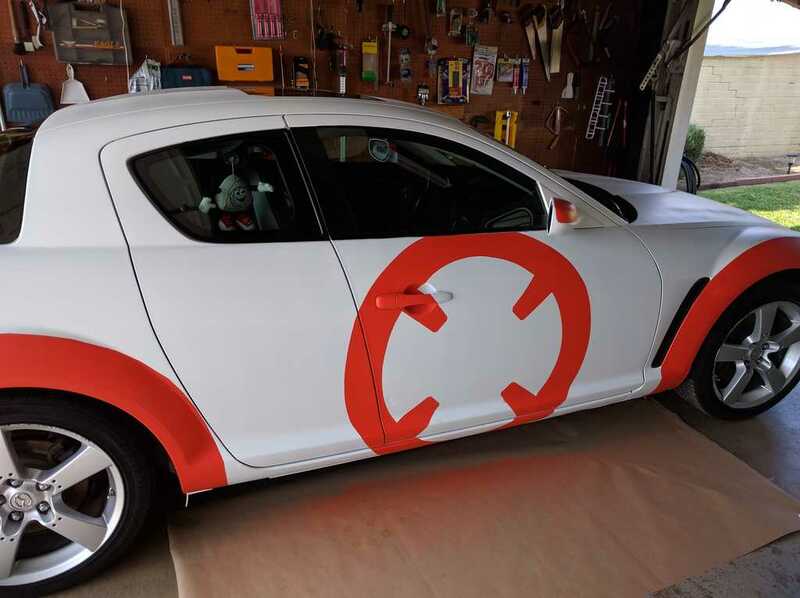 The circular BB-8 graphic meant it'd be extremely challenging to measure out with a ruler. I turned to video projection to help guide my masking tape. It is not quite a perfect solution because the side of a car is not flat like a proper projection screen. 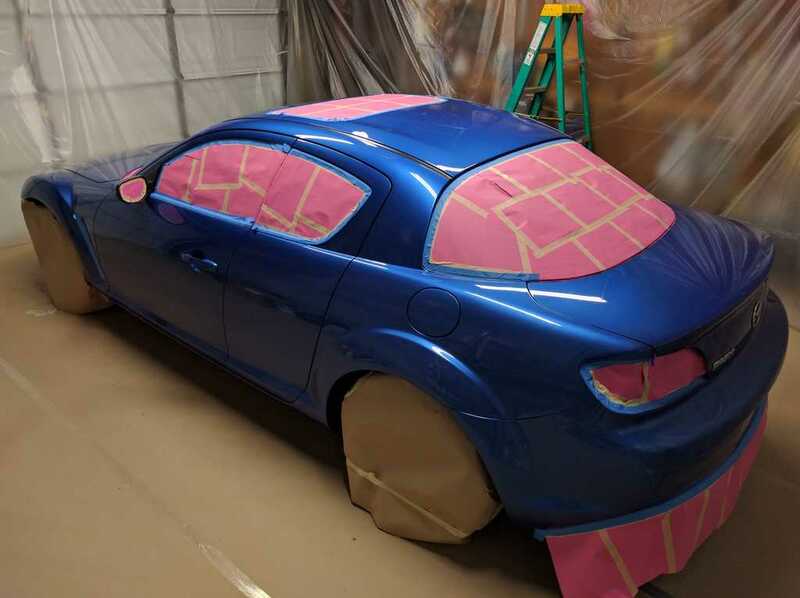 The curved side of the car meant the circle is distorted at the top and bottom so some freehand work was still required to make everything look good. 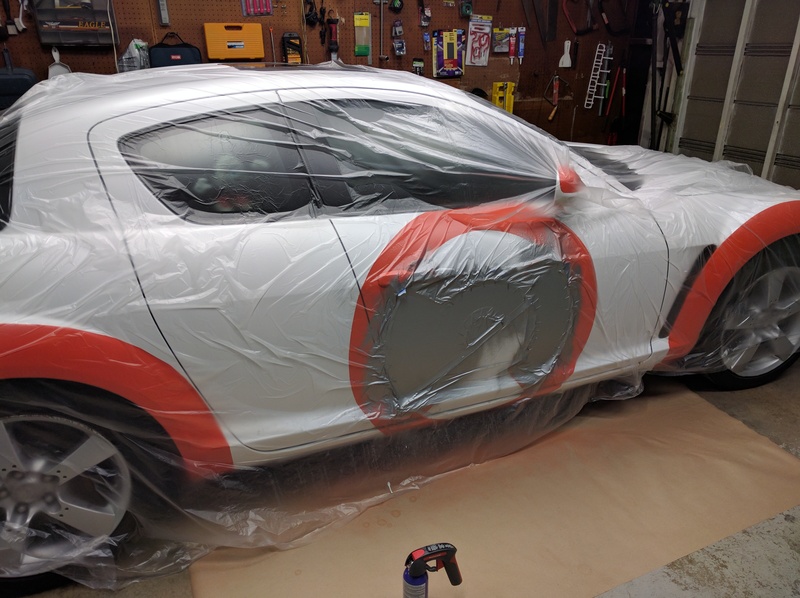 Once the masking tape was in place, out comes the spray can for three coats of orange, followed by removal of the mask. The process was then repeated for the silver center. And now, for a change of pace: Sharpie markers. I wanted to explore the possibility of using color markers to create detail that would be difficult, impossible, or just overly tedious for me to create with masking tape and spray. 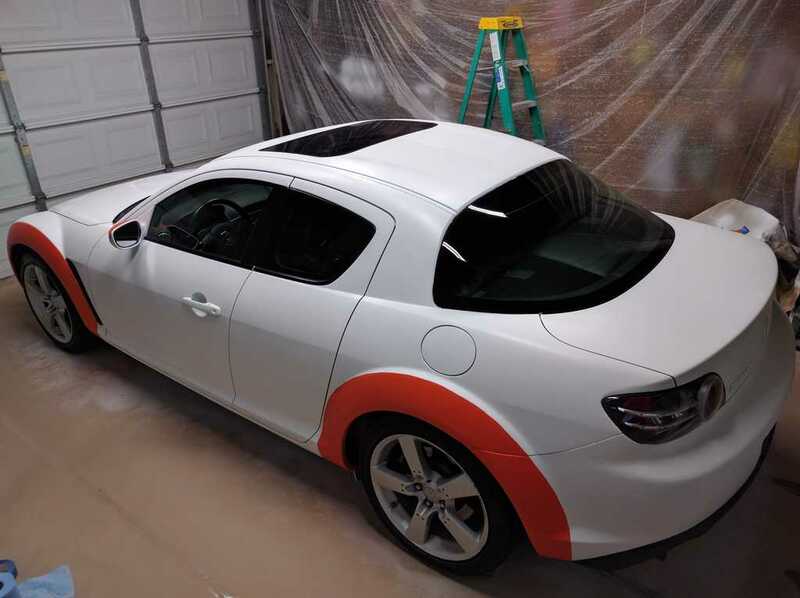 The trunk lid provided a smaller surface that is ideal for tackling a small test project. 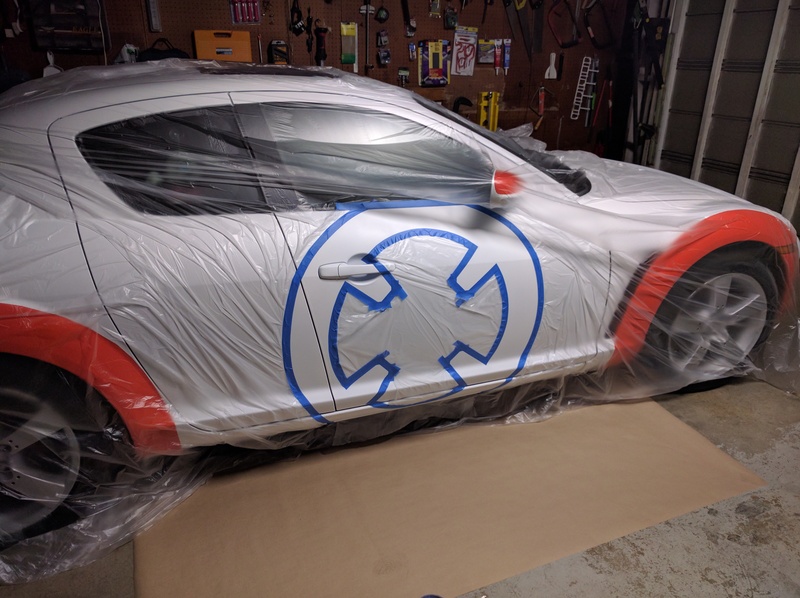 I took a screen capture of BB-8 doing his famous lighter thumbs-up and projected that image onto the trunk lid for tracing with markers. I'm happy to report that color Sharpie ink and white Plasti-Dip interacted well for this purpose. After the markers were given a few hours to dry, I then used clear Plasti-Dip spray to seal the design. 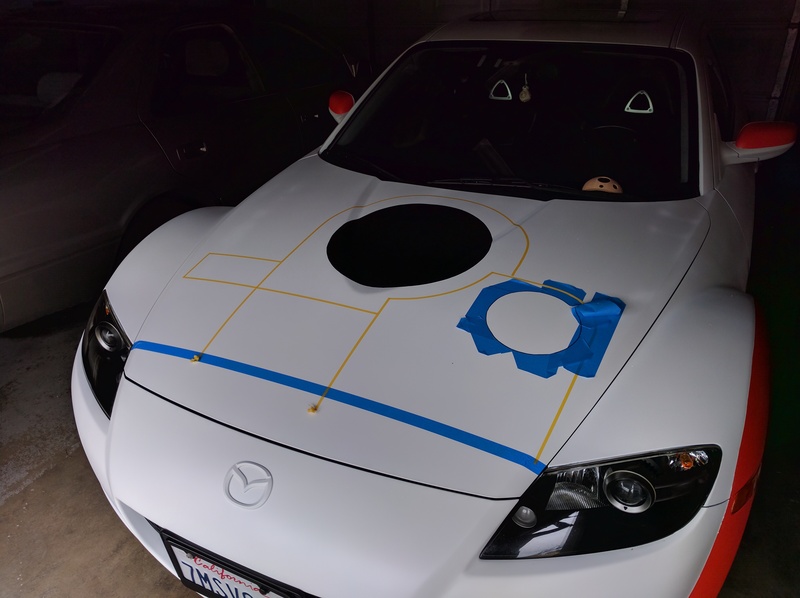 Just for fun, I also used the marker to alter the RX-8 emblem on the trunk lid. Since I wasn't going to cut into the plastic, it wouldn't look neat no matter what I do, so the crude free-hand style worked perfectly. 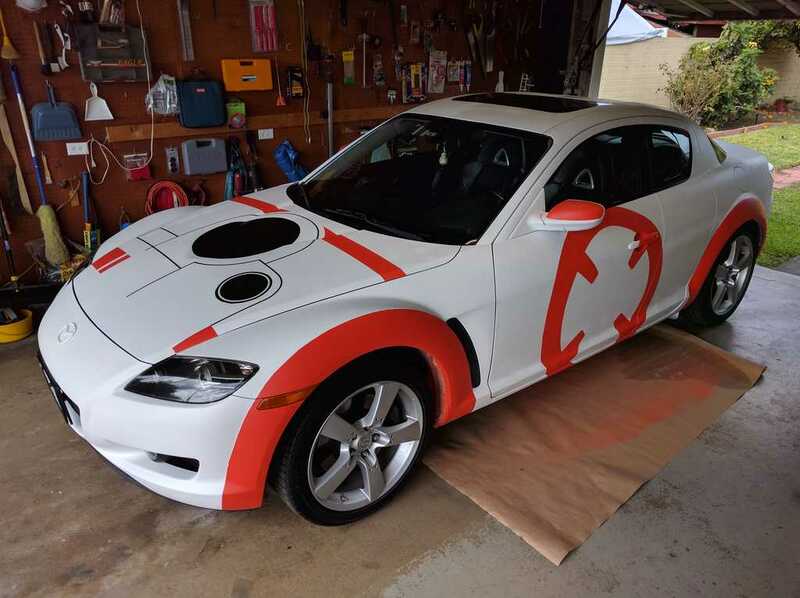 I went back and forth whether I wanted to put BB-8's face on the hood or another orange circle graphic on the hood. 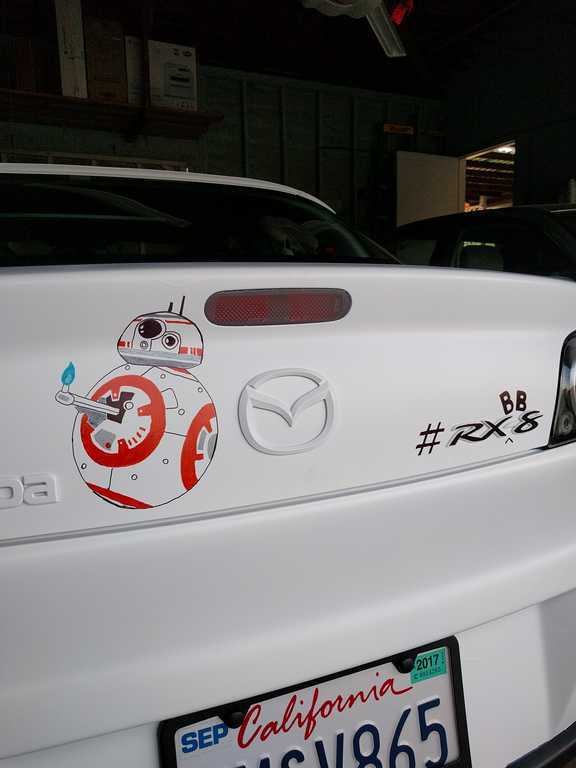 If I went with the circle graphic, I wasn't sure where BB-8's face would be. 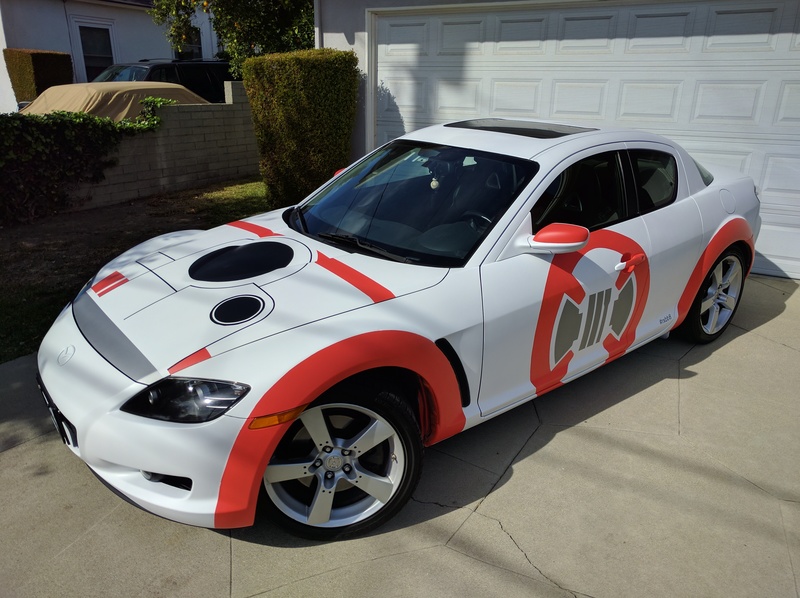 The best candidate was to put the BB-8 face on the windshield sunshade, Pixar Cars style, but then it would only be visible when parked. 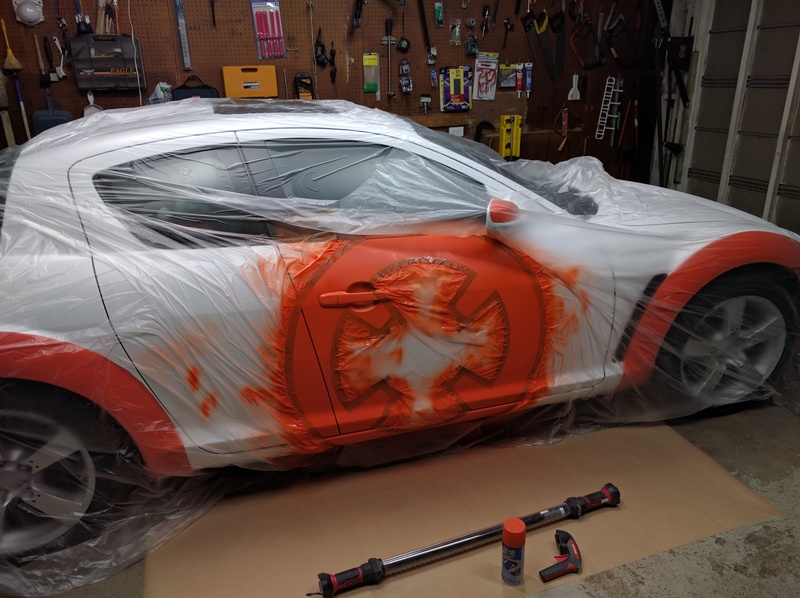 Eventually I decided to paint BB-8's face on the hood, distorted as it may be. 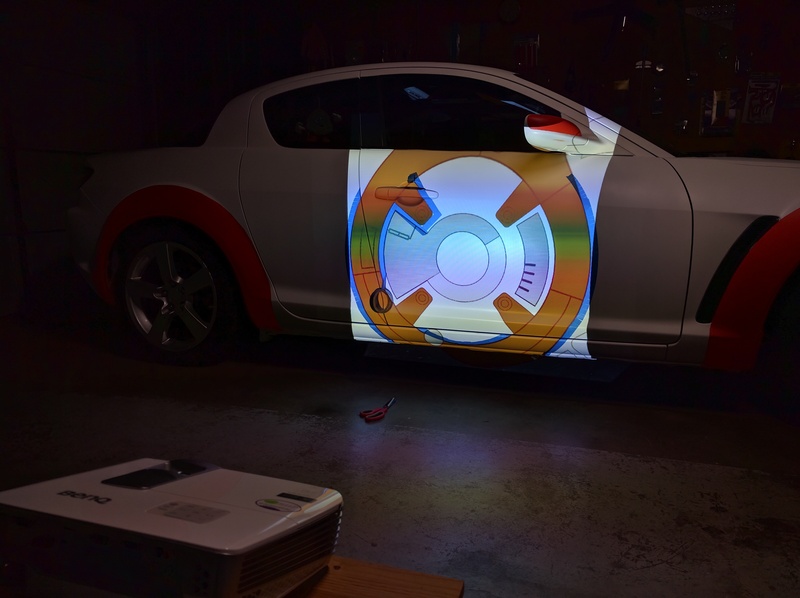 I tried to use the video projector trick again to guide the masking tape but there wasn't a secure way to mount the projector to aim straight down at the hood. After a close call that nearly ended with the video projector smashing against the hood, I decided to revert to using old-fashioned rulers to measure and transfer the design. I no longer recall exactly what I used as templates for the two big circles. Looking at the pictures, I think they were paint lids. The big one for a 5-gallon bucket, the smaller a 1-gallon can. 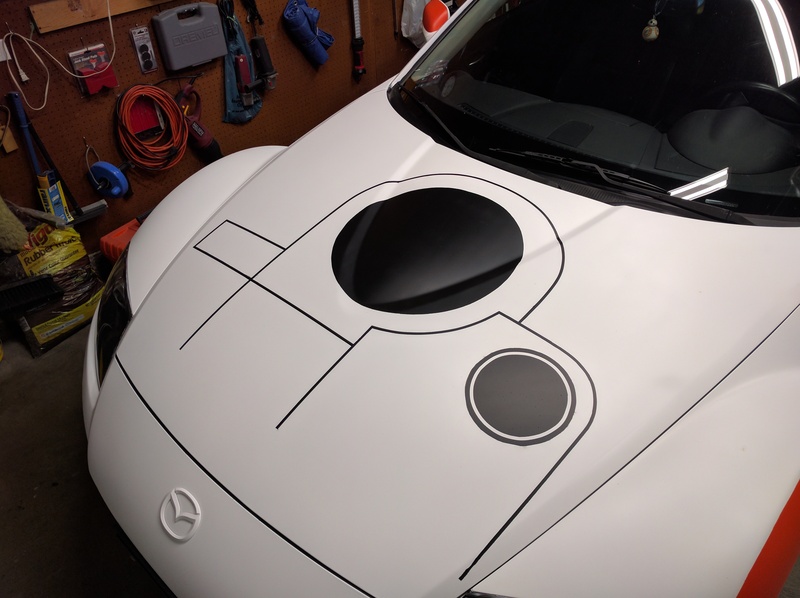 I debated using permanent markers for the thin lines, but eventually decided on masking and spraying with black Plasti-Dip. 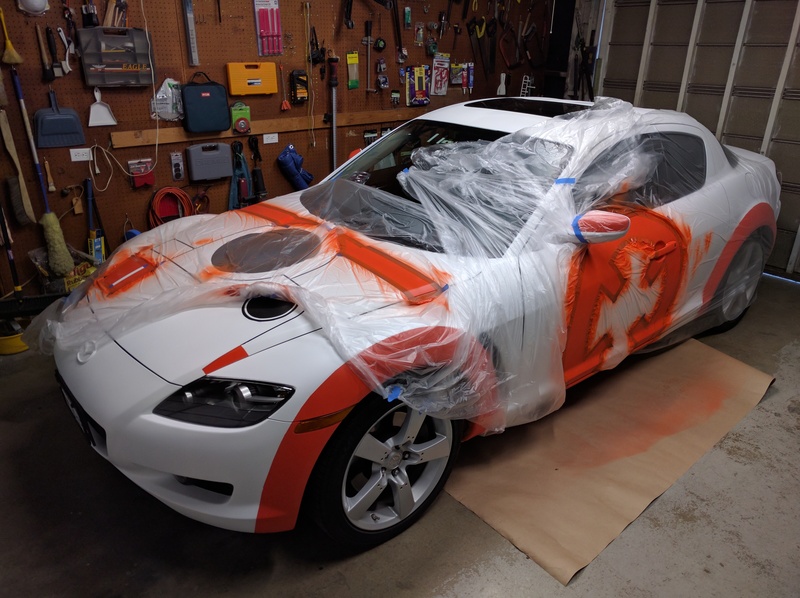 In an attempt to be more efficient, I consolidated the driver's side door and the hood for masking and spraying their respective orange components. And repeat for the silver components. 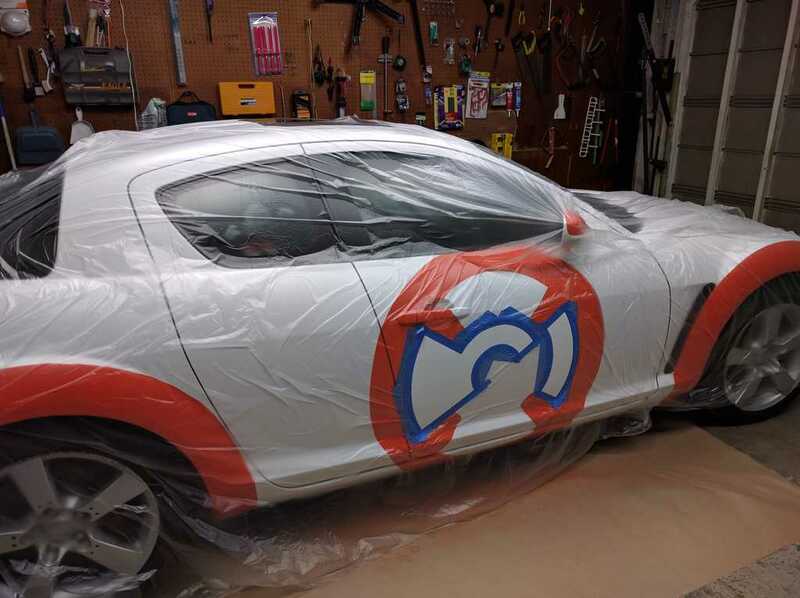 I had originally intended to spray the rear edge of the hood (closest to windshield) silver, as implied by the masking tape, but aborted at the last minute. And here is the "After" picture for the #rxbb8 project! My Mazda RX-8 is now wearing a BB-8 Halloween costume. Star Wars, R2-D2, BB-8 and related entities are property of Disney/LucasFilm. This is a personally funded fan project completely unaffiliated with Disney/LucasFilm. No endorsement by Disney/LucasFilm is expressed or implied as they have a fully operational legal department and I cannot withstand firepower of that magnitude.